The Materials Selection page describes our selection of materials healthy for ourselves and the environment, and includes a video featuring the low-VOC paint. One of the most visible products in the house that needed to be considered from both durability and toxicity perspectives is the paint. As well as being decorative it’s used to protect surfaces from degradation, which maximises the lifetime of products such as the timber joinery around the windows. But this need for protection needs to be balanced with the potential impact paint can have on the environment. 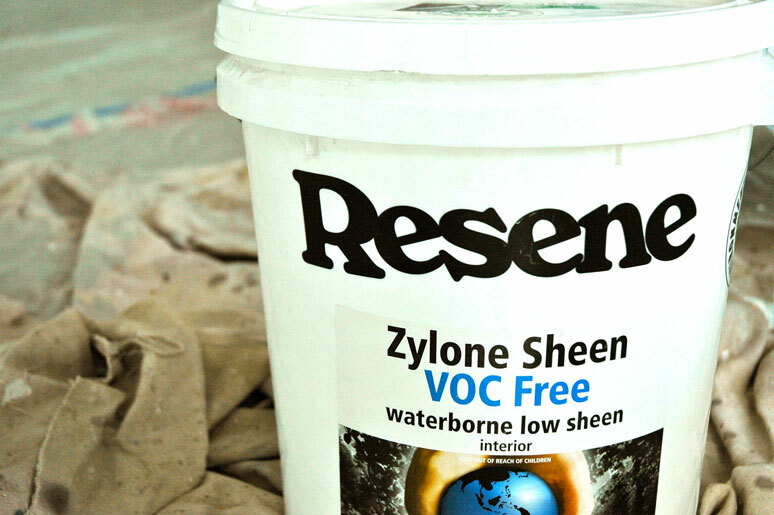 We chose to use a selection of waterborne paints from Resene which provide excellent protection and durability while releasing a far lower level of VOCs per litre than solventborne paints. VOCs or Volatile Organic Compounds can cause short and long term health issues and are released from paints (as well as other things used in houses). All of the Resene paints we’ve used have been approved by the Environmental Choice programme, which allows customers to recognise products that minimise environmental effects in their production, distribution, use, and disposal. Environmental Choice NZ is a third-party certification scheme that guarantees a product is produced with a lower environmental impact than standard products on the market. All of the paints used throughout the house are from Resene. We've selected low-VOC paints to minimise any health impacts during construction and living in the home. All of the paints are certified by the Environmental Choice programme, which guarantees lower environmental impact that standard products.